A low key Burns Night tonight (compared with last year's). There's a vegetarian haggis in the oven and a bottle of Laphroaig in the cupboard, but I'm not particularly in the mood for socialising right now. In a minute I am going to terrify the kids by blasting away on my dad's old bagpipe chanter (like him and Laphroaig, also from Islay), something that I have still to learn to play. 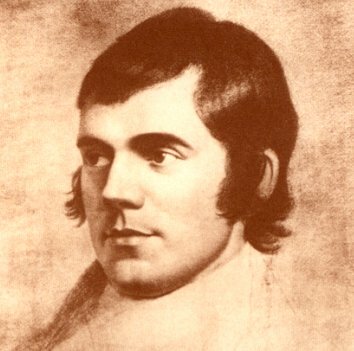 If you've never read any Robert Burns (25 January 1759 – 21 July 1796), can I just recommend a look at his Tam O'Shanter, a tale of a drunken night and stumbling on 'a dance of witches' on the way home? There's some interesting Scottish dialect words in the light of later wider usage - Burns uses 'dub' to mean 'mud', and 'cutty sark' - the name of a famous tea clipper now in Greenwich - means a 'short skirt'.